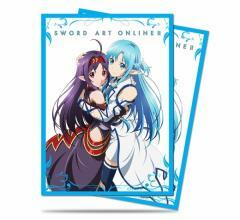 Always have back up by your side with these officially licensed Deck Protector sleeves featuring Yuuki and Asuna from Sword Art Online II! These sleeves protect your trading card game cards and are made with Ultra PRO's proprietary ChromaFusion printed layer material for minimal delamination and added durability. All Ultra PRO Deck Protector sleeves are archival-safe and made with polypropylene materials. Printed with vibrant, full-color artwork, these sleeves will be sure to make your deck stand out at your next gaming session. These sleeves are sized to fit standard (Magic) size sleeves and comes with 65 sleeves per pack.